Just checking in to say I went to Pizza Express tonight and had their all-new vegan pizza! It's called Pianta, and the toppings are rocket, spinach, mushrooms, artichokes and pine nuts. The base is a spicy arrabbiata, which might be a bit much if you're not used to spicy food. Overall, I was very impressed; usually I am a bit iffy about simply ordering a pizza without cheese (most restaurants don't offer vegan cheeses) because it's never quite the same, but in this case, I hardly even thought about the fact that there was no cheese because it was so flavoursome. In fact, I'm pretty sure it's the olive oil that gives pizzas their great taste. I'll definitely bear that in mind when topping making my own cheeseless pizzas at home! Go out for some fresh air, because that'll probably put things into perspective. We're consciously uncoupling, the past half-year and I. When the surface-mail packages containing the rest of my books and clothes arrive (the ocean is considered a surface), when I get some work, when I shake off my raging FOMO, that means I will finally possess the necessary cognitive tools to deal with running into the past half-year in a mutual hangout spot, smiling and making small talk like we didn't have this thing that started off with the sweetest of intentions yet ultimately brought out the worst in each of us. The main obstacle so far has been finding jobs around here that I can even apply to, i.e. jobs that are not managerial positions or involve driving. Obviously, my eventual goal is to get out of my parents' house in this town where I don't have any friends, but I've kind of accepted that I probably need to keep looking at local jobs until I get enough money to go far away to the big city and follow my dreams à la Christina Aguilera in Burlesque. I am also trying to settle back into actual veganism, which I haven't been too strict about for roughly a year. And I mean, that allowed me to enjoy local delicacies like crêpes. Unfortunately, while all my groceries were vegan, I had started actively buying things like chocolate whenever I was feeling down. Even though that remained pretty much my only vice, it straddled the line between "occasional treat" and "harmful habit". I think back to how great both my mental and physical health were when I was fully vegan (a two-year period). I'm trying to recuperate those things, so it makes sense to go back to being fully vegan. I'm tired of feeling crappy, especially when I need to take extra care not to stagnate at this point in my life! I've been doing some cooking. Artichoke pasta (best). Curried apple and onion soup (very nice). Udon noodles with broccoli and tofu (not bad for a rookie). 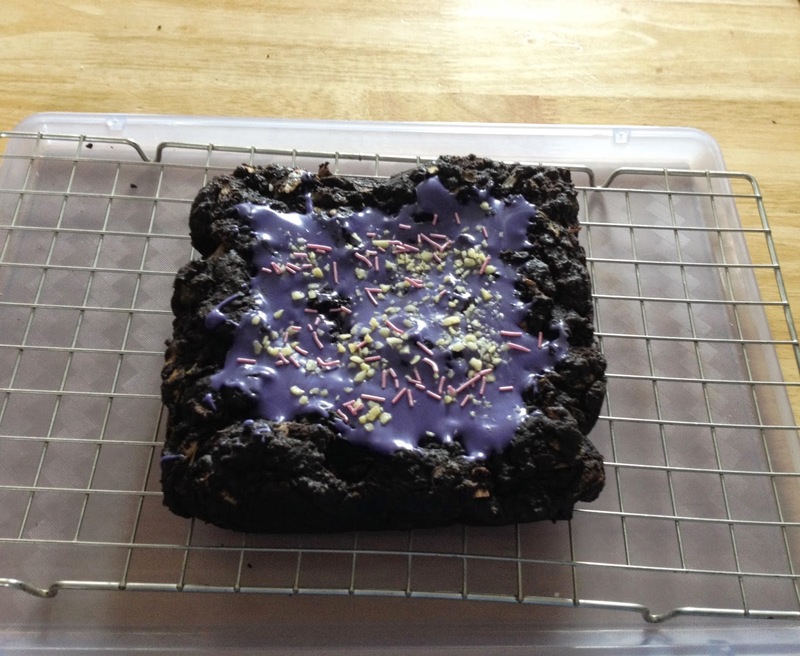 Courgette and carob cake (I've done this before and it was good but something was off this time. At least it looks cute, get a load of that pastel). On that health note, I'm working on my anxiety. It's something I find hard to talk about, because a lot of the time I get a "just stop worrying!" response (like it's that straightforward), or "yeah, I get stressed too, before exams" (how about basically every single day?). I don't think there really is a long-term cure... it's something you have to try to bridle for the rest of your life. Manufactured in Massachusetts, purchased from a co-op in Rimouski, and Google tells me they are also available in this country. It's a natural stress remedy, a pastille that you chew. I'm not sure whether it actually works - it's certainly not a replacement for anti-anxiety medication - but it certainly doesn't make me feel any worse, and chewing something kind of forces me to think of other things. To me, tea is a great investment. There's a tea for every occasion! You'd have thought that being back in England would mean savouring a "proper cuppa", but I've actually come to prefer the endless selection of fruit and herbal teas out there. I gave up coffee a couple of months ago because I found it was making my heart race in a not-good way. Also, tea has a fresher feeling in the morning. My favourites right now are Twinings Camomile & Maple, and Teapigs Super Fruit. I've kept some sort of diary since I was 11. I find it very helpful to write down the things that are causing me anxiety. In particular, it can highlight your patterns or triggers. When I am in the grip of one particular worry, that horrid feeling can last from a day to a month - whatever time it takes to assure me that my worst fear isn't going to come true. You just have to ride it out, but making your worry somewhat tangible and knowing you've had a similar one before can remind you that it most likely is your mind playing tricks. This is the latest Sufjan project (with Serengeti and Son Lux), and for some reason I find this song more calming than any self-proclaimed "chillout" music. When you feel / like driving your car / into a telephone pole / just stop it, you got it! It goes without saying that the rest of the record is awesome and I'll be hard pressed to name a better one in 2014 even though it is only April. I'm also really into FKA Twigs at the moment. Her music is calming and sensual and refreshing.